Thank you, Lauren, from healthy-delicious.com for this Valentine’s Day treat! Stock up on this simple homemade candy…it can be kept in the refrigerator for a few weeks. Line a sheet pan with either a a silpat or a 9×11 piece of parchment paper sprayed lightly with cooking spray. Create a double boiler by setting a bowl over a small pot of simmering water. Add the chocolate to the bowl and stir until fully melted. Working quickly, spread the chocolate in a ¼-inch layer over the prepared baking pan. 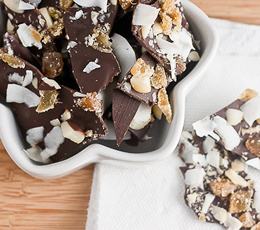 Scatter the ginger, coconut, and macadamia nuts evenly over the chocolate – be careful not to leave any big gaps! Transfer the baking sheet to the fridge for 1 hour to allow the chocolate to set. Once the chocolate is firm, use your hands or a sharp knife to break the bark into roughly shaped pieces.